Physics Buzz: Chemists taken in by Cold Fusion . . . AGAIN! The ACS is not the only organization to be "taken in" by cold fusion. In October, the 15th international cold fusion conference was sponsored by the ENEA (the Italian National Agency for New Technologies Energy and the Environment), the Italian Physical Society, the Italian Chemical Society and The National Research Council (CNR). In November the U.S. Defense Intelligence Agency published "Technology Forecast: Worldwide Research on Low-Energy Nuclear Reactions Increasing and Gaining Acceptance" DIA-08-0911-003, 13 November 2009. So there are quite a number of gullible, mainstream institutions. Also, I note there were a dozen other press conferences at the ACS conference, on other topics, and for that matter, the plasma fusion and high energy physicists hold a press conference every time they manage to make their machines work. Why did you not attack these as inappropriate? Of the citations on your web page, I can instantly dismiss the APS meeting abstracts. They aren't peer reviewed. Anyone can "publish" anything they want in the meeting proceedings. Until proven otherwise, I'll assume the same is true of all the other conference proceedings on the list. I'd have to take some time to learn about the other journals. The only one I instantly recognize as a reputable journal is Phys. Rev. C. That article is from way back in 1993, and as far as I can tell, it only concludes that IF cold fusion is occurring, something weird must be happening for there to be no neutrons. This implies that an equally valid conclusion is that nothing weird is going on, and that excess heat measurements associated with cold fusion are not nuclear at all. Perhaps they result from chemical reactions, or perhaps they're simply measurement error. There's no reason to criticize the validity of plasma physics. It's difficult to achieve, but the sun and stars demonstrate its validity continuously. High energy physics machines work, so I don't see the parallel to cold fusion at all. I'm not familiar with the other topics covered by ACS press conferences, I just happen to know that cold fusion is fringe science at best. Even if there's some underlying novel effect, it's not at the press conference level, particularly when promises of unlimited energy are constantly bandied about. "The problems with cold fusion were apparent within weeks of the Pons and Fleischmann announcement, and they haven't changed in 21 years." Heat has increased from a fraction of a watt and ~15% of input to between 20 W and 100 W with no input power. Repruducibility has gone from 10% to 20% to 100% with some techniques. The NRL recently repeated the Arata experiment several hundred times in a row with automated equipment, completely degassing the samples between runs. It worked every time. So I do not see why you say that nothing has changed. "Of the citations on your web page, I can instantly dismiss the APS meeting abstracts. They aren't peer reviewed." There are 3,709 citations in the LENR-CANR bibliography, including 1,200 from peer-reviewed journals, as I noted. "Anyone can "publish" anything they want in the meeting proceedings." On the other hand, it is rather difficult to publish in Jap. J. Applied Physics, J. Electroanal. Chem., J. Fusion Energy or Naturwiss., and the internal peer-review standards at Los Alamos and China Lake are reportedly even more rigorous than those journals. "Until proven otherwise, I'll assume the same is true of all the other conference proceedings on the list." I suggest you review this subject more carefully before reaching any conclusion, positive or negative. It is difficult to understand. In the opinions of many experts, such as Gerisher, it has been proven otherwise. Until you have examined these expert opinions and the data they base their opinions on, I doubt you have any business contradicting or second guessing them. It may be difficult to get into all sorts of journals, but if cold fusion is a promising as the folks at the ACS press conferences claim, it belongs in Science, Nature or PRL. In fact, it was covered in those journals until it was thoroughly debunked. Buzz Skyline, what is your real name please? My name is James Riordon. We've met at a few APS conferences over the years. I'm an ACS member and I feel a bit ashamed that the ACS is endorsing this sort of fringe science. "It may be difficult to get into all sorts of journals, but if cold fusion is a promising as the folks at the ACS press conferences claim, it belongs in Science, Nature or PRL." I suggest your review what the editors of Nature wrote about cold fusion. You might agree with people such as Schwinger, who found it biased, and over the top. Please bear in mind that there have been many academic disputes in history, and the big journals such as Nature have not always been right, nor the more specialized ones such as J. Electroanl. Chem. always wrong. In any case, I suggest you judge this issue based on the merits of the claim, and criteria such as the signal to noise ratio, rather than the title of the journals that oppose the research. I think it is a bad idea for you to let John Maddox do your thinking for you. "In fact, it was covered in those journals until it was thoroughly debunked." Experts such as Schwinger and Gerischer did not think it was debunked. I do not think so either. If you think so, and you would like to make a serious effort to flesh out your assertion, I suggest you write a paper. Describe exactly how, why and where it was "debunked" and what constitutes debunking. I would be pleased to upload this paper. even if it is not published in a journal. Only about a dozen peer-reviewed papers that attempt to find errors in cold fusion experiments have been published. You can read most of them at LENR-CANR.org. See Morrison, for example. In my opinion, these papers have no merit. Perhaps you can do a better job. That's the strange thing about it - ACS is one of the world's top science societies. It's great that they encourage open discourse about anything their members want to work on, including cold fusion. What I object to is the press conferences, which provide cold fusion with a false legitimacy that's completely at odds with the topic's actual status in the scientific community and literature. I don't know how they choose press conference topics at ACS, but surely there are lots of exciting, mainstream developments they could cover instead. Extraordinary claims require extraordinary proof. When that's available, then it will be time to trot out the press. "That's the strange thing about it - ACS is one of the world's top science societies. It's great that they encourage open discourse about anything their members want to work on, including cold fusion. What I object to is the press conferences, which provide cold fusion with a false legitimacy that's completely at odds with the topic's actual status in the scientific community and literature." What is your basis for saying that cold fusion has a special status? The researchers are nearly all distinguished professors in major institutions. If they were not, they could not get funded, because there is academical political opposition to the research. The research is funded by the Italian Physical Soc., DARPA and others. It is controversial, but so are many other areas after all. Academic freedom dictate that when a group of 2,000 senior researchers want to study a subject or conduct a press conference at a chemistry conference, they should be free to do that without interference from people like you, who disagree with their findings for unspecified reasons. It seems to me you are saying that because you don't like this subject, professors at Osaka U. and U. Illinois should not be allowed to talk about it. To be blunt, who put you in charge of academia? Who nominated you to decide what is legitimate? "I don't know how they choose press conference topics at ACS, but surely there are lots of exciting, mainstream developments they could cover instead." You misunderstand. Cold fusion is an exciting, mainstream development. Mainstream people publishing in mainstream journals are doing it. "Extraordinary claims require extraordinary proof. When that's available, then it will be time to trot out the press." This "extraordinary claims" assertion is not a principle of science. It was coined by Carl Sagan for the 1980 "Cosmos" television series. Conventional scientific standards dictate that extraordinary claims are best supported with ordinary evidence from off-the-shelf instruments and standard techniques. All mainstream cold fusion papers present this kind of evidence. I think you should stick to textbook science instead of made-for-TV pop-science. If you talking about replicated, high sigma proof, that has been available in abundance since 1991. Cold fusion has been replicated in roughly 17,000 experimental runs by hundreds of major labs, sometimes at very high s/n ratios (millions of times over background), according to a tally from the Institute of High Energy Physics, Chinese Academy of Sciences. I do not understand why you do not consider that sufficient to prove that it exists. By the standards of normal, conventional science there is no question about it. You seem to be inventing some new kind of science where the old rules of replication, s/n ratios, and publication do not apply, and by some arbitrary and undefined standard the work is not legitimate because . . . because . . . you say it isn't. I have not run into many people like you in recent years. Again, I invite you to write down your thoughts in a formal essay or paper, and publish them. (I am quite serious.) You may be the last "skeptical" holdout. Seriously? The last skeptical holdout? I'm not sure where you're hanging out, but it's not at our meetings, which are the largest annual gatherings of physicists in the world. Or in the halls of any physics department I've been to. Yep some of the cold fusion faithful are in major universities, but their colleagues don't share their views. If they did, cold fusion would have made it into one of the APS journals that their peers review. But that hasn't happened for at least 17 years, as far as I know. Is there some other reason it doesn't appear in our journals if I'm the last skeptic? Does ACS have press conferences on intelligent design, too? "Does ACS have press conferences on intelligent design, too?" Good point. No, it does not. And the Italian Physical Society and Chemical Society do not sponsor conferences on intelligent design. Ergo, cold fusion does not resemble intelligent design. Cold fusion is backed by a huge amount of high sigma data from major laboratories whereas there is not a shred of evidence for intelligent design. "Seriously? The last skeptical holdout? I'm not sure where you're hanging out . . ."
No, that sentence was not serious. That was my idea of a joke. However, the previous sentence -- that I encourage you to write something -- is entirely serious. The thing is, your views are widely shared. Roughly half of professional scientists and engineers polled in Japan agree with you. Ten out of 18 of the 2004 DoE panel agreed with you. However there has only been two small books and a dozen papers written by scientists that make a serious attempt to rebut the data or show errors. We have just about every one of these papers, plus the DoE review panelists' remarks but it does not add up to much. Whereas I have thousands of papers that support the cold fusion findings. So it would be a service to both sides if you would make a sincere effort to write down your arguments and muster some facts to support them. I do not think you can find any facts to buttress your case, but I wish you would try. I mean that with 100% sincerity. I am not being the least bit sarcastic, although it may sound that way. I strongly believe in letting everyone have their say. I asked Huizenga and some of other leading skeptics to contribute papers and books to the collection, to give it balance, but most of then refused. I personally am proud of the fact that LENR-CANR is not only the world's largest library of cold fusion papers, it is also the largest collection of anti-cold fusion papers. There are no "skeptical" anti-cold fusion websites as far as I know. "Heat has increased from a fraction of a watt and ~15% of input to between 20 W and 100 W with no input power. Repruducibility has gone from 10% to 20% to 100% with some techniques. 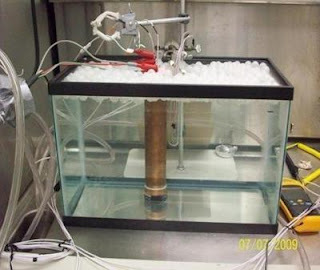 The NRL recently repeated the Arata experiment several hundred times in a row with automated equipment, completely degassing the samples between runs. It worked every time. So I do not see why you say that nothing has changed." Those numbers sound a little revisionist. Have you read the papers listed on your site? P&F claimed 27 W and up to 1000% of input in their first cold fusion paper in 1989. By 1992 there were claims up to a kW output (Yuan). Since 2000, most claims are only a few watts, and in the most recent, heavily promoted gas-loading papers, including the work you refer to, the power output is less than a watt. That looks like things have changed all right; for the worse. Claims of 100% reproducibility under certain conditions date from at least 1994 (McKubre), and yet in his 2008 paper on reproducibility he only claims about 70%, and in Hubler's 2007 review, he claims an overall success rate in the field of 1/3. Not much change there. Moreover, McKubre said in 2008: "...we do not yet have quantitative reproducibility in any case of which I am aware." In most of science, reproducibility means more than getting the sign right. If it's really possible to produce 20W - 100W with no input power, and with 100% reproducibility, then why did CBS's 60-minutes find it necessary to hire someone to verify excess heat in cold fusion? You don't need calorimetry to detect 100W (or even 20W). And you shouldn't need to refer people to the literature. With 100% reproducibility, it should be easy to charge up 10 or 20 chunks of paladium so they are all giving off 100 W, then take them on the road. Drop them in beakers of water, and watch it boil. Mountain climbers can use them to keep their hands warm on Everest. But just out of curiosity, where is this 100W output with no input reported? In any case, the claim that nothing's changed since 1989 was also made in 2004 by the expert panel hired by the DOE to study the state of cold fusion. The panel was presented with the best the fusioneers could offer, and the DOE has as much to gain from the success of CF as anyone, but they still came up empty. "If it's really possible to produce 20W - 100W with no input power, and with 100% reproducibility, then why did CBS's 60-minutes find it necessary to hire someone to verify excess heat in cold fusion?" That's what he reported! 20 W out, with long periods of no input (heat after death). That is exactly what Duncan discussed, at the U. Missouri seminar and in Rome. The Energetics Technology results. They hired him because he is a leading expert in calorimetry, but as he said, you don't need an expert to confirm this. "You don't need calorimetry to detect 100W (or even 20W)." Quite right. That's what Duncan said. "But just out of curiosity, where is this 100W output with no input reported?" "The panel was presented with the best the fusioneers could offer, and the DOE has as much to gain from the success of CF as anyone, but they still came up empty." The panel was 8 in favor, 10 against. I wouldn't call that "empty." But it took only one day to look at the data, and I feel that the 10 against were biased and unscientific. For example, reviewer 15 rejected the findings because they have been discussed in Popular Science, and several others rejected experimental findings because they are not yet explained by theory. That is a violation of the scientific method. Rothwell wrote: "However, the previous sentence -- that I encourage you to write something -- is entirely serious." It sounds more like a rhetorical device to win support from the audience. It is perfectly reasonable to be skeptical of CF without reading all the literature and writing an essay rebutting all the results, just as it is not necessary to keep up with the perpetual motion field, or the intelligent design field, to be skeptical of them. On two occasions, in 1989 and in 2004, the DOE hired experts to examine the field in detail, and report back. The DOE, and the government it represents, would reap huge strategic and environmental benefits if CF were real, and yet both times the panels concluded the evidence for nuclear reactions is absent, and that essentially no progress was made in the interim. For must of us, that's good enough. To attract attention again, CF has to come up with something new, something obvious, something incontrovertible. Give us one good demonstration of heat from water, not 17000 vague calorimetry measurements that take a PhD to interpret. Frankly, I don't understand why that is so difficult for a tabletop experiment that is claimed to have the potential to power the planet. Rothwell: "That's what he reported! 20 W out, with long periods of no input (heat after death). That is exactly what Duncan discussed,"
Ah, so there was power in, just not at the same time as the power out. How long are those periods? Because, don't you agree, CBS would have made a much bigger impact by disconnecting the electrodes and carrying them (or the cell), over to a glass table, cooling it down with a fan or an ice bath, and then videotaping it get hot again with an ordinary mercury thermometer? It seems like it should be pretty easy to make a convincing demonstration of 20 W out with zero in. But what I saw on that show was anything but convincing. They could have claimed anything with all those tubes and meters. ""But just out of curiosity, where is this 100W output with no input reported?"" Sorry, I'm gonna need a little more than that. "The panel was 8 in favor, 10 against." Again, a little revisionist. The 8 in favor agreed that there was compelling evidence for excess heat. Only one agreed there was compelling evidence that the excess heat came from nuclear reactions. "Compelling" is good, but it is less than "convincing". If you have a device that can produce 20W-100W with no power input, then you shouldn't bother arguing on blogs like this or trying to publish papers. That's plenty of power to be useful for running all sorts of things, from toys to flashlights to laptops. I don't have to do research to see that a Duracell battery works, so I shouldn't have to do research to prove to myself that this works. Just go into business selling the things at Walmart. Or even better, start selling power back to the electric company. Then there's no reason to convince anyone of anything. They read the meter and send you a check. When you become a millionaire, then you'll be laughing and I'll eat crow. What would really impress me is if you rent space on the show floor at the next APS March meeting (don't worry, it's cheap), set one on the table and turn it on. Then take orders and let us know how many you sell. Ah, so there was power in, just not at the same time as the power out." "How long are those periods?" As I recall, a couple of hours in some cases, during a 2-day run. "Because, don't you agree, CBS would have made a much bigger impact by disconnecting the electrodes and carrying them (or the cell) . . .
Well, there were no specifics in the CBS program. Not numbers at all regarding power or the input to output ratio. They don't actually disconnect the power leads to the electrodes but you could I suppose. Anyway there are also gas loaded cells that have no input at all. "But what I saw on that show was anything but convincing. They could have claimed anything with all those tubes and meters." Duncan is an expert in calorimetry well used to looking at tubes and meters. You couldn't fool him. Again, a little revisionist. The 8 in favor agreed that there was compelling evidence for excess heat. Only one agreed there was compelling evidence that the excess heat came from nuclear reactions." There is no chemical fuel in the cells and no chemical transformations or ash. Some cells have produced 10,000 times more energy than any chemical cell of the same mass could produce (300 MJ from a few grams of material), and tritium has been detected at levels ranging from 50 times background (Los Alamos) to millions of times background (10E18 atoms at BARC). Helium is produced at the same ratio to the heat as it is with plasma fusion. So I would say that is definitely a nuclear reaction and probably fusion. I think that conclusion is inescapable. You and some of the panel members come to some other conclusion, but I cannot understand why. I find it convincing, and so do thousands of scientists. "If you have a device that can produce 20W-100W with no power input, then you shouldn't bother arguing on blogs . . ."
I personally don't have anything. The ENEA (government of Italy) the NRL and various other national and private laboratories have things like this. However they have greatly reduced the mass of the cathodes, from ~20 g go ~0.1 g and somewhat reduced output, from a maximum of ~100 W down to ~20 W because 100 W is dangerous. Also, I am not arguing. I am teaching. "That's plenty of power to be useful for running all sorts of things, from toys to flashlights to laptops." As you see from the graphs the power is not stable, so it cannot be used for any practical purpose. That will have to wait until they can control the reaction better. Gas loaded systems seem promising in that regard. Also, that's 20 W of heat, not electricity. The temperature is low because the electrolyte is at 1 atm, so Carnot efficiency would be low and you cannot convert it to electricity. However, your basic point is correct, and it is what McKubre said on "60 Minutes." Once they learn to control the reaction there is no reason to think it cannot be made into a practical source of energy. "What would really impress me is if you rent space on the show floor at the next APS March meeting (don't worry, it's cheap), set one on the table and turn it on. Then take orders and let us know how many you sell." That's quite impossible. These things take weeks or months to set up, and they are rather delicate, like experimental transistors in 1952 which "stopped working when someone slammed the door." That's why Duncan had to go to Israel. A practical implementation with gas loading may be possible in the near future but I doubt that electrochemical cell of this nature will ever be practical. For now, you will have to be satisfied with conventional scientific data published in mainstream journals. I assume you are satisfied with such data in other areas of science, so I am puzzled as to why you reject it in this particular area. That does not seem rational. It sounds more like a rhetorical device to win support from the audience." I have uploaded several anti-cold fusion skeptical papers. Just about every one that was ever published. This proves I am sincere, and this is not a rhetorical device. "It is perfectly reasonable to be skeptical of CF without reading all the literature and writing an essay rebutting all the results, just as it is not necessary to keep up with the perpetual motion field, or the intelligent design field, to be skeptical of them." I did not say the author should rebut all results. Some would be fine. McKubre alone would be fine. As I pointed out earlier, intelligent design is not supported by the ENEA or the Italian Physical Society, and you will not find hundreds of papers about it in mainstream journals, so it does not resemble cold fusion at all. "On two occasions, in 1989 and in 2004, the DOE hired experts to examine the field in detail, and report back. The DOE, and the government it represents, would reap huge strategic and environmental benefits if CF were real, and yet both times the panels concluded the evidence for nuclear reactions is absent, and that essentially no progress was made in the interim." "For must of us, that's good enough." Someone's opinion is good enough? I suggest you look at scientific papers and data instead. "Give us one good demonstration of heat from water, not 17000 vague calorimetry measurements that take a PhD to interpret." I have seen many convincing demonstrations. I do not have a PhD but I have no difficulty interpreting the calorimetry. It does not seem vague to me. Granted, I have spent a lot of time building and using calorimeters. If you find calorimetry vague or baffling, then I suggest you do not know enough about that subject to judge these results, so perhaps you should refrain from criticizing or reaching a conclusion. Generally speaking, before you decide a scientific result is true or false, you should be familiar with the subject area. Some of the 10 DoE panel members who rejected the findings do not know enough about calorimetry to judge this issue, in my opinion. Cold fusion has become the iconic example of pathological science. It's sad that people are taken in by this, and shameful that the American Chemical Society is complicit in the sham. As a Public Information Officer at the APS and the president of the DC Science Writers Association, I feel that the media office at ACS is acting irresponsibly in holding press conferences on cold fusion. Michael Bernstein is listed as the main contact on the ACS cold fusion release. It would be great if he could come to the DC Science Writers Professional Day event on April 17 (www.DCSWA.org) to explain himself during our session on ethics for PIOs. I'll happily cover his registration fee. ""How long are those periods?" As I recall, a couple of hours in some cases, during a 2-day run." """Toyota." Sorry, I'm gonna need a little more than that." Beautiful. For credibility, you claim hundreds of peer-reviewed papers in mainstream literature. But to counter the suggestion that nothing has changed in 21 years, you offer your recollection of a non-published experiment, and a non-peer-reviewed conference proceeding from 1993 by a father of cold fusion who inexplicably left the field in his scientific prime. And then you wonder why it's hard to take fusioneers seriously. "Cold fusion has become the iconic example of pathological science." Langmuir proposed six criteria for pathological science. Cold fusion does not meet any of them. Calling an apple an orange does not make it an orange. "Beautiful. For credibility, you claim hundreds of peer-reviewed papers in mainstream literature. But to counter the suggestion that nothing has changed in 21 years . . ."
I did nothing of the sort! You asked where Toyota published their heat-after-death results, and I told you. Take it or leave it. If you want to establish the credibility of the field, I suggest you read 20 or 30 papers. Pons, S. and M. Fleischmann, Etalonnage du systeme Pd-D2O: effets de protocole et feed-back positif. ["Calibration of the Pd-D2O system: protocol and positive feed-back effects"]. J. Chim. Phys., 1996. 93: p. 711 (in French). Cold fusion is such a good example of a pathological science that it's specifically listed in the Wikipedia entry. "So there matters stand: no cold fusion researcher has been able to dispel the stigma of 'pathological science' by rigorously and reproducibly demonstrating effects sufficiently large to exclude the possibility of error (for example, by constructing a working power generator), nor does it seem possible to conclude unequivocally that all the apparently anomalous behavior can be attributed to error.". By academic tradition these people have a right to their opinion, and they should be allowed to present scientific papers and hold press conferences without being accused of fraud. Even if they are wrong, they are supposed to be given a respectful hearing, not accused of being scammers. You seem to have no respect for academic freedom. Many of these people are world class experts in electrochemistry, calorimetry, materials, tritium detection and other relevant fields. Bockris and Flieschmann literally wrote the book on these things. Are you quite sure -- are you absolutely certain -- that you know more about these subjects than they do? You are right and they are wrong? Are you sure they are not only wrong but they are actually conducting a scam (for some inexplicable reason)? This is hubris. I suggest you tone it down, and think twice before you make reckless, unfounded accusations. "Cold fusion is such a good example of a pathological science that it's specifically listed in the Wikipedia entry." I do not think Wikipedia is necessarily an authoritative or reliable source. Claiming that something is pathological, even in the vaunted pages of Wikipedia, does not actually make it pathological. Instead of blindly taking the word of the anonymous Wikipedia experts, I suggest you examine the six criteria and compare them to the published literature on cold fusion. You will see that none of them apply. For example, claims of great accuracy are not made, and no explanation is proposed. The number of supporters seems to be growing, as you saw at the APS, and the Physical Soc. of Italy, the U.S. DoD and elsewhere. This is despite efforts like yours, to attack APS for allowing "scams." Normally, distinguished scientists do not have to contend with such accusations, so the number of supporters grows in proportion to the quality and quantity of data. Are you still sure this is a scam? No second thoughts? Do you really feel comfortable leveling that accusation against a few thousand elderly professors? Do you have any evidence for a scam? That is a rather extreme & serious thing to say. You sound like a scientific version of the Tea Party movement. Bad science should not be foisted on the public through press conferences. The practice has been part of the cold fusion nonsense since the beginning when Pons and Fleischmann held their first press conference, rather than following the usual peer review process. Yep, it's a scam. It's a waste of money. It's a waste of time. That's bad enough, but what's truly horrible is that an esteemed organization like the ACS put a stamp of approval on something that even they don't allow in their journals any more. I'm only somewhat concerned about the deluded researchers (and shysters), but I'm very concerned with the misleading and misguided publicity the ACS media office is giving to the pathological science of cold fusion. Oops. You said "sham" not scam. Sorry! But now you say "scam." There were several other press conferences at the APS about various subjects. Are you going to attack them, as well? "Yep, it's a scam. It's a waste of money. It's a waste of time. That's bad enough, but what's truly horrible is that an esteemed organization . . ."
Academic freedom doesn't count? Distinguished scientists are not allowed to make mistakes, or to present any subject you disagree with? You sound like Rabi, Kusch, Thomas, Bohr and von Neumann when they ganged up to stop Townes from developing the laser. He quoted them in his autobiography: "Look, you should stop the work you are doing. It isn't going to work. You know it's not going to work. We know it's not going to work. You're wasting money. Just stop!" I assume you meant to write ACS, rather than APS. The APS will put on a cold fusion press conference if and when someone makes a breakthrough that passes muster in our peer review process. In fact, I personally GUARANTEE we'll host a press conference if cold fusion makes it back into our journals. Why would I criticize the other press conferences at the ACS meeting? I only noticed one pathological science press conference this year. If you know of another, point it out. In fact, I wrote a blog post highlighting 10 ACS press conferences on topics that, unlike cold fusion, don't appear to be at odds with any laws of physics. On the bright side, one of the benefits of the ACS press conference is that cold fusion, zero point energy, anti-gravity, and 911 conspiracy theorists can now rest easy knowing that they will have a science meeting where they'll feel at home. That should free up some space at our annual meetings, and save me the trouble of declining to host press conferences for them at APS meetings. Rothwell: "I did nothing of the sort! You asked where Toyota published their heat-after-death results, and I told you." You can't just rewrite history that's only days old, when a complete transcript is right here. You repeatedly try to give the field credibility with your collection of peer-reviewed papers, and you did it in your first post in this discussion. In fact, it's the feature you say separates you from the creationists. So, presumably you're not disagreeing with that part of my claim. "Heat has increased from a fraction of a watt and ~15% of input to between 20 W and 100 W with no input power." When asked about the source of the 20W and 100W numbers you did not cite peer-reviewed papers, but referred to a presentation by Duncan (of work done by a proven fraud) and a conference proceeding from 18 years ago. So you did something exactly of the sort! In fact, one is lead to conclude that results in the peer-reviewed literature are not up to the task of countering the suggestion that there is simply no progress in the field. There are more experiments, there are a few different types of experiments, but the evidence for fusion is no better, and the size of the effect is ever smaller. Rothwell: ""Extraordinary claims require extraordinary proof. ..."
This "extraordinary claims" assertion is not a principle of science. It was coined by Carl Sagan for the 1980 "Cosmos" television series. [...] I think you should stick to textbook science instead of made-for-TV pop-science." popularized by someone very good at science communication, but the idea has a much longer academic history than that. Two centuries ago, Laplace said "The weight of evidence for an extraordinary claim must be proportioned to its strangeness", and in 1976, Marcello Truzzi, a sociologist whose expertise was investigating extraordinary scientific claims, wrote, " And when such claims are extraordinary, that is, revolutionary in their implications for established scientific generalizations already accumulated and verified, we must demand extraordinary proof." He is usually credited with originating the more abbreviated form popularized by Sagan. So, the idea is well established in ordinary textbook academia, not just TV pop-science. Moreover, Sagan had bona fide scientific credentials of his own; moreso in any case than science fiction writers like Arthur C Clarke and Jules Verne, who CF advocates love to quote. 1) Most of the papers appeared shortly after the dramatic 1989 claim, and have been trickling in at just a few per year for a long time. 2) Many of the refereed papers are negative results. The positive outnumber the negative, to be sure, but once the reasonable scientists were satisfied that there is nothing to see here, they moved on. Something about beating a dead horse. 3) If valid, CF would represent a revolution in nuclear physics, so "mainstream publications" would ordinarily mean mainstream nuclear physics publications, but none of the claims of fusion have appeared in mainstream nuclear physics journals. 4) The experimental results consist mostly of anomalous temperature readings, but the suggestion that they are caused by fusion is a theoretical explanation reached by the process of elimination. Accepting that explanation means rejecting a much larger body of literature which predicts nuclear reactions cannot explain the reported observations of heat. It may be difficult to find experimental errors or chemical reactions to explain the observations, but the ratio of prediction-to-observation is far smaller for fusion than for either chemistry or experimental error. 5) The results are all over the map, and some are contradictory. There is no consistent relationship between the amount of Pd or water to the heat; some groups use light water as a control with no effect, others claim excess heat with light water. 6) The CFists can write an equation like D + D -> 4He + heat without blushing. What is the initial form of the heat? How is momentum conserved? How does it couple to the lattice. The mind boggles. Rothwell: "Academic freedom doesn't count? Distinguished scientists are not allowed to make mistakes, or to present any subject you disagree with? " What are you reading? He said nothing against academic freedom or making mistakes, and he explicitly said anyone is welcome to present at ACS and APS. The objection was to a society-organized press conference, of which only a few are provided, for a field that is, in the consensus view, voodoo science. If ACS doesn't hold a press conference on perpetual motion, are they violating academic freedom? Rothwell: "You sound like Rabi, Kusch, Thomas, Bohr and von Neumann when they ganged up to stop Townes from developing the laser. He quoted them in his autobiography: "Look, you should stop the work you are doing. It isn't going to work. You know it's not going to work. We know it's not going to work. You're wasting money. Just stop!"" Similar objections have also been applied to perpetual motion, homeopathic medicine, mind-reading, and the like, and in those cases, they are most likely valid. In Towne's case, Rabi & Kusch, to whom that quote is attributed, did not claim the ideas violated principles of physics (according to Townes). The others did briefly, but were soon persuaded. In any case in a few years, with only a few people, Townes silenced his critics. Unlike the laser, but like perpetual motion, CF is seen to violate established physical principles, and like perpetual motion, after 100s or 1000s of times more man-hours of effort, it has zilch to show for it. So, CF is much more like perpetual motion than it is like the laser. Rothwell: "The DoE assembled a panel of 18 people for one day, threw a bunch of papers at them, and asked them to arrive at a conclusion." One day should be more than enough time to convince experts of 100 W out with zero power in, and that it is nuclear. Rothwell: "8 out of 10 recommended funding. " The panel was split on whether the evidence for excess heat was compelling; 1 of 18 found the evidence for nuclear reactions convincing. The panel was generally agreed that the work was sloppy (although they were less blunt). The panel was nearly unanimous in recommending that funding agencies should entertain well-designed proposals on specific issues relevant to the field. And they endorsed apple pie. Rothwell: "The Defense Intelligence Agency asked ~100 scientists to look at this for several months, carefully, and almost every one of them agreed to the recommendations in the D.I.A. report,"
If the 100 scientists were researchers in the field like the named contributors were, that doesn't mean anything. There is no mention of these scientists in the report. Do you have some documentation, or a list of names? In any case, report only says that evidence indicates that nuclear reactions may be occurring, and the closest thing to a recommendation that I found in the report is "DIA assesses with high confidence that if LENR can produce nuclear-origin energy at room temperature, this disruptive technology could revolutionize energy production and storage, since nuclear reactions release millions of times more energy per unit mass than do any known chemical fuel." Who could possibly disagree with that hypothetical? In other news, if someone can produce and contain antimatter, LENR won't be needed. Rothwell: ""For must of us, that's good enough." Someone's opinion is good enough? I suggest you look at scientific papers and data instead." Not just someone's opinion, the opinion of a panel of experts, which happens to line up pretty well with the current scientific consensus. In fact, I do make a habit of accepting opinions of experts on many subjects. If a cardiologist recommends a bypass, I may want a second opinion, but I won't be asking an electrochemist. Rothwell: "I have seen many convincing demonstrations. I do not have a PhD but I have no difficulty interpreting the calorimetry. It does not seem vague to me." The problem is that calorimetry is needed. And that is what makes me skeptical of CF's ability to produce 100W out with zero in. Rothwell: "If you find calorimetry vague or baffling, then I suggest you do not know enough about that subject to judge these results, so perhaps you should refrain from criticizing or reaching a conclusion." You're missing the point. The claim of 100W out with zero in is sufficiently pronounced that expertise shouldn't be necessary. I don't have to understand solid-state electronics to judge amplification, or superconductivity to accept levitation due to the Meissner effect, or aerodynamics to identify heavier than air flight. Rothwell: "Generally speaking, before you decide a scientific result is true or false, you should be familiar with the subject area. " The subject area, superficially at least, is heat, and I am familiar with heat. Everyone is aware that burning wood or gasoline produces it, that electric current produces it, that nuclear fission produces it, whether or not they understand the chemistry of combustion, resistive heating, or reactor physics. Rothwell: "Some of the 10 DoE panel members who rejected the findings do not know enough about calorimetry to judge this issue, in my opinion." Now, here is where "someone's opinion" is not enough. I shall let you people have the last word on this subject. Let me add only that I urge people on both sides of the dispute to read full, original source materials, rather than secondary sources. Many of the journal papers are not available on LENR-CANR.org because of copyright restrictions, but they are listed in our bibliography and in the Britz bibliography, and you will find them in a university library. Sorry to stay on this, but there are a few last points I wanted to tie up. Rothwell: "However they have greatly reduced the mass of the cathodes, from ~20 g go ~0.1 g and somewhat reduced output, from a maximum of ~100 W down to ~20 W because 100 W is dangerous." I don't see how 100W can be dangerous. It should be easy to contain 10 or 100 times that. Millions have been spent on the research, and they're afraid of 100 W? No matter, 20W is still observable without calorimetry. Rothwell: "As you see from the graphs the power is not stable, so it cannot be used for any practical purpose. " There are ways to smooth out the power, but ok, screw the practical applications. If they can make 20W without any input, then disconnect, remove, and cool the cell until all its components are below ambient temperature, then set it on a table, and watch the temperature climb above ambient. For a liter of water and some small electrodes, an hour or so at 20W should be enough to raise the temperature from noticeably below ambient to noticeably above, even without a thermometer. Rothwell: "That's quite impossible. These things take weeks or months to set up, and they are rather delicate, like experimental transistors in 1952 which "stopped working when someone slammed the door." Making transistors in 1952 had a low success rate. Are you saying CF has a low success rate, at the same time you're arguing it has high reproducibility. I'm confused. What is delicate? Do the aligator clips fall off the electrodes when you look at them the wrong way? Table-top electrolysis that takes months to set up does not sound like progress to me. What is it that takes so long? I thought the essential parameters were all under control since the mid-90s. Rothwell: "That's why Duncan had to go to Israel." And that's why the show was less than convincing. Rothwell: "For now, you will have to be satisfied with conventional scientific data published in mainstream journals. I assume you are satisfied with such data in other areas of science, so I am puzzled as to why you reject it in this particular area." For my part, I made a partial list of reasons in another post. But it boils down to: the publications are low quality. That's what the DOE panel said, and even the latest summary of ICCF 2009 said that most publications give incomplete information. Rothwell: "Well, there were no specifics in the CBS program. Not numbers at all regarding power or the input to output ratio." I'm no producer, but it seems reasonable that CBS would have tried to find the best demonstration they could for their dog and pony show. And, by your account, for a safe demonstration, that means 20 W power out with zero power in, for a couple of hours. If that account is right, they could have done better than showing indecipherable complexity and asking the audience to take some paid-for expert's word for it. Rothwell: "Duncan is an expert in calorimetry well used to looking at tubes and meters. You couldn't fool him." Anyone can be fooled. Ask David Copperfield. And it is all the more likely by someone who has already been judged guilty of fooling people, especially on his own home turf, playing by his house rules. Rothwell: "Some cells have produced 10,000 times more energy than any chemical cell of the same mass could produce (300 MJ from a few grams of material), "
Presumably this is Roulette et al in the non-refereed, ICCF1996 proceedings, so once again, you undermine the importance you give to peer-review, and the claim of great progress in the field. Anyway, absolute energies are rather arbitrary, because it is just a matter of time. If an experimental error gives a somewhat elevated power, all you need is some patience to produce any energy value you like, and if there's one thing fusioneers have in abundance, it's patience. Rothwell: "and tritium has been detected at levels ranging from 50 times background (Los Alamos) to millions of times background (10E18 atoms at BARC)." The BARC results are from a frantically performed experiment (by their own admission) within weeks of the 1989 press conference, and published in an internal report in 1989. I didn't see a peer-reviewed article in your library that contains these results. So, your best tritium result is from 1989. That's progress? Since then, none of the tritium results have come within a factor of 100 of the BARC results, which makes the levels orders of magnitude too small to account for the reported heat. Those results may or may not be valid, and represent interesting physics if they are, but they do not provide evidence that fusion at room temperature can produce heat at a practical level. Producing fusion on the table-top is not difficult, as I'm sure you know. Small commercially available devices do it everyday, but back in the real world, fusion produces neutrons, and they are sold as neutron generators; the process is too inefficient to produce net energy out. Rothwell: "Helium is produced at the same ratio to the heat as it is with plasma fusion." It is an amazing coincidence that of all the reported products of nuclear reactions (T, n, alphas, transmutations), none are observed at levels consistent with the reported heat, except the only one that happens to exist in the background at about the same level. That it correlates weakly to heat is not surprising, since degassing and permeation are strongly correlated to temperature. It is particularly easy to ignore these results because Steven B Krivit has done a detailed evisceration, demonstrating that they are fishy at best. Rothwell: "So I would say that is definitely a nuclear reaction and probably fusion. I think that conclusion is inescapable. You and some of the panel members come to some other conclusion, but I cannot understand why." Presumably, the panel members did not find the results you quoted above, and others credible. And they probably cannot understand why you do. For moi, it is because there is so little progress in the age of Moore's law; because it doesn't seem to scale in any predictable way; because the energy always seems to fall short of a clear uncontestable demonstration like an isolated, self-sustaining, touchably-obvious, heat-generating box. Oh, and because those hot fusion guys are paying me a bunch of money not to believe it. Anonymous, you're the Lone Ranger of physics rationality. Thanks for all your posts, mysterious stranger. That was correct, except today there is a conventional explanation on the table, mine (Thermochimica Acta 397 (2002) 95), that has not been eliminated. It has the potential to explain much (if not all) of the apparent excess heat data from Fleischmann-Pons type cells, and possibly others, and is currently ignored by the cold fusioneers (CFers), probably because they believe E. Storms in his 2007 book where he says he proved my explanation “to apply to neither flow nor Seebeck calorimetry” and “the calibration errors proposed by Shanahan are absent”, which is untrue. This ignoring of the unloved conventional explanation is one of the biggest indicators that CFers are pathological scientists. That problem also exists for the claims of He formation, heavy metal transmutation, and neutron detection by CR39 SSNDs. In my 2002 publication I present a speculative mechanism that has the potential to explain all of the above difficulties. They are all tied to what forms and sustains the surface state that promotes the conventional hydrogen+oxygen chemistry I use as the basis of my explanation. What does have to be done however is some conventional research into this surface phenomenon, which is incredibly difficult to do as it seems to be very fragile. In my 2006 response to Storms (Thermo. Acta 441 (2006) 214) I point this out in the only Figure in the paper. It is not clear if useful information can be obtained after the experiment is stopped, and thus one would have to study the electrode interface while in situ, a very difficult task. For completeness, my suggestions were also denigrated by Szpak, Mossier-Boss, Miles, and Fleischmann in 2004, and I replied to them in 2005 (Thermo. Acta 28 (2005) 207), demonstrating how my proposal could explain their results. Also, I tried to get my 2002 paper into the hands of the 2004 DOE reviewers, but it never made it, per conversations with two people on the panel that I know. Therefore, the reviewers had a biased set of data to look at. I believe they would/could have been much harsher in their conclusions if they had realized a conventional explanation was available and being ignored. Finally, Buzz and Anonymous are right in blasting Jed on his flippant quotes of ‘the great successes’ of the cold fusion field. Jed is big on sensationalism and very small on documentation. Another generic problem of the cold fusion field is the lack of critical review at the individual research group level. The CFers accept nearly any claim that supports their preconceptions, and Jed and the CFers lump them all together to ‘prove’ CF is real, all of which is poor scientific practice. You guys seem pretty smart so maybe you can help us a little. Reading about this stuff some years ago we decided to make one of those gadgets wit the paladium. We went to the salvage yard and gota whole bunch of those cattle lidic converter things and took out all them beads. Ed owns the yard and says there is paladium in the beads and gets a fair mount of money for em but he owed us a favor for getin rid of some stuff for him. Its kind of a ripoff as them beads are mostly stuff thats not the paladium. One of guys up at the mine said he knew what to do and he has a back shed with weird stuff. Anyways he used some acid that sounded like what those latinos call water. Afew months later he gaves a small chunck of stuff back he said was it. Wernt much of it. We were going to put in a big thermusbottle because all them drawins seem to put it thermus bottles. We coudn;t see why so we put it in crock pot. Gomez at that tourist trap trading post has a lot of Indian jewwerly and had lots of silver wire. I knowed from my scool days that silver really can carry the electrisity a bunch so we silver soldered some of that to the chunck of stuff. Then we got a bunch heater type wire and made a mat of it that we held in the top of the crock pot. Earl got us some of that heavy water really didn;t feal all that heavy. Earl said you can order it. But thats one of are problems. Then went to the big scrap yard and got whole bunch of those thrermo thingees from gas water heaters. They got em for keepin the pilot lights workin. The guy at the mine says they make electrisity with heat. We tried one out with boiling water and it don;t make much. So we got whole bunch of em and epoxyd them to the crock pot. Twisted them all together and connected em to car battary. Joe figured out how many of em we had to hook together to get enough for the battery. We had enuff for a few bunches twisted together. Then we poored the heavy water in the pot and hooked up the silver wire and the heating wire to another battery. All these guys messin with this wrote you got to put the juice to it for long time. We let er sit ther for a few days. Had to put the battery charger on the battery a bunch.. Need to let you know Joe stuck some nails in the battery where the lead is under the plastic and wrapped the silver and heater wire around different nails. The crock pot didn’t do much but after awhile it bubled some. Joe said not to lit a match near it cause he said it would pop. Anyways along about the 5th day or so it started a boilin. We really were getin juice from that thing so we let er rip. 1 problem we have is it was boilin this heavy water away and Earl charged us 25 bucks a quart for it. We started wit 3 quarts actually Earl said they were more than a quart as they were them soda pop litters. I mean like the too litter bottles.you can get mountain dew in, I kownd we use more of the espensive water than it was worth the lite bulbs we were litetin. Somebody said you can make the heavy water by freezin it out of it a bunch of times. They said it is less a thmble a gallon so you got to freezed some out of regular water and then put it in another can and thaw and freezed it some more out and do it a bunch. We had a lot of the big beer cans around here the ones that held a quart so we filled a bunch of them and set it em out at night. Catch is you got to get em before they completely freeze. Staying up all night was no deal even if we were addin more beer cans to the pile. Anyways we don;t think we got any. Earl got us some more of them big quarts of the stuff again so we could try it again but we need some help getin this stuff. It costs too much from Earl. We figure we got to get some money back from this deal and I saw you said you can sell the elecrisity back to the power company. Weed like to do that if we can. So how do you do that. Right now we don;t buy much from em cause we got a extra wire up the poll they don;t know about. We power the shop from the fuel sell thing we made a few years ago. Works good but we use too much grain makin the fuel. Ben a few days and ain;t got any help on the heavy water. Milford and Heysus the lineman in this parts says the electic company has gots to lets us connect for renewabl electrisity but they didn't know bout no paladium fusion gadget. But we got more questions cause some smart alecs sayin it won;t work. first I tell you about the smart alecs and ther writtins and then I will make another writtin with are questions. Some smart alec on another these blog writtins wrote are crock pot couldnt of worked cause I didn;t write anything about the electrolyte. Well I did;t bother you with that cause it was no sweat. Are electrolyte worked real good. Let me clue you about are brother Daryl. He was scool smart so pop sent him off to some fancy glove scool back east. He said they do sciance there two but im not so sure. Anyways he spent a lot of years there and finally says hes finished and he is a fizzacyst. Hes always going around telling everybody how him and is buddies knowed everything about everything and thered going to even have a therery of everything. Yeah sure. That glove scool has a lot of them Irish guys livin near by and he brings this Shawnesy guy around some who always telling us are stuff wont work cause we has got mistakes. Well are stuff works. I think he gets into the Guinnes a little two much. Him and Daryl ar always telling stories bout them little bitty people he calls strange and then even says they got charms. Bet there lucky two. Anyways he is into the leprecon thing as they once was talking about I guess aprentis leprecons. Called them leptons. This week they said they going to figur out gravity. Said they got to find the Higs bosun. So whats some guy from a ship spose to know about it. Daryls a pain but hes family so we got to fergive him. We used up are last quart of heavy water from Earl and the dang thing boiled it way agian and then got hot enuff it cracked the crock pot. Going to take us awhile to wire up a new 1. For the electrolyte smart alec were not dum and we can read the instructions on the internet. Most of the instructions said to use LiOD. We just asked are buddy at the mine and he said it was like lye and makes the heavy water carry electrisity. The instructions said aluminimin helps two. Well a can of Draino was right there on the shelf. We put about a teaspoon per quart in the heavy water and stired er up a bit befor we started puttin the juice to er and wala. Luke and me wont to know if you think Draino is as good as the LiOD stuff. When Daryl was here last week and I showed him we didn;t have no koolem barrier in the crock pot. Then he says it was in the heavy water. Well I held are last quart up to the light and there wernt no koolem barrier in it I could see. Just in case I poored the last quart through a strainer. Didnt see nothin in the strainer. Luke and me wont to know if we should strain the heavy water everytime. I think Daryls fibbin us but are last quart from Earl went mitety quick. Daryl didn;t think we could make one of them nuclar reactors or a gravity machines either and we showd him. I finally got around to watching that cold fusion news conference, and realized that the reason ACS deserves criticism for hosting it is that the pathetic panel of losers did not in fact have any news to report. We got McKubre, with his arms folded in a defensive posture, rocking autistically, insisting, as P&F did 21 years earlier, that there is definitely heat, and it is definitely nuclear. In the Q&A, McKubre referred to the medical doctor in Israel (who lost his license in the US for fraud), who claims output power 25 times the input, which is only a little better than P&F claim of 10 times, but well short of all the claims of power out without power in. Not only is it not news, but it should be embarrassing to the scientists on the panel who have been pursuing the CF grail for 20 years, having to report results from a fraudulent medical doctor who just recently (on a CF time scale) got involved. We got Hagelstein repeating the generic wisdom that theory is needed to guide experiment, but without giving any indication of progress toward such a theory, making it appear more like the blind leading the blind. We got Miley, who mispronounces the name of his own field (nucular physics a la George Bush), who seems to find it difficult to cobble together a coherent sentence, telling us that the field is very complex; the usual excuse for the lack of progress. He talked about the importance of voids (hardly new), and about making batteries, but then admitted that he had absolutely no idea how he was going to do it, apart from possibly having to produce heat first. Quick. Alert Duracell. We got Miles, who informed us that he is not Miley, reporting codeposition experiments with 6 of 6 successes, which sounds familiar. No tests of interlab reproducibility yet, which, for McKubre, always requires interchanging people. In the Q&A, Miles repeated the very tired hypothetical that if we can get all the Ds to fuse, that would be one shitload of energy. Oh, and he also told us that you can make a calorimeter from copper tubes and insulation. Welcome to two centuries ago. You're all a bunch of idiots. Hot fusion has been heavily funded for over 50 years and hasn't gotten anywhere, but no one questions its viability. Also, getting published in a peer reviewed journal is a crock. Just a bunch of poor grad students toadying up to the establishment, making some tiny perturbations to the existing heap of knowledge. When is the last time you've read something truly enlightening from your favorite journal? 50% of US citizens believe in virgin birth. Ask yourself why you believe what you do. I know hot fusion works because the sun and stars run on it. We have also demonstrated man made hot fusion many times in the form of fusion bombs. We at Physics Buzz even posted a story (http://physicsbuzz.physicscentral.com/2010/06/diy-fusion-there-goes-neighborhood.html) about a guy who built his own inertial confinement fusion device in a warehouse in Brooklyn (it works, by the way, as you can tell by monitoring the neutrons it emits). I have my doubts that magnetically confined fusion will ever be technologically feasible, but it at least has its foundations in established physics. Cold fusion of the Pons and Fleischmann variety would require modifications to physics that would have repercussions in all sorts of ways besides just allowing for cold fusion. We don't see any signs of those things, so there must not be any new physics of the type that cold fusion requires. Therefore, cold fusion doesn't work. The above are the reasons I believe what I believe about fusion. I don't get the virgin birth connection. But it's not addressed in any physics journals that I know of anyway. Why don't the APS form a committee and visit one of these cold fusion laboratory to see if the phenomenon is real? The committee can help the APS to decide whether to hold a press conference for cold fusion or not. Well that's a great shame isn't it. Looks like you will just have to live with those repercussions and become a true scientist and build theory on observation. Welcome to reality.